Ok he needs no introduction however many may not know Kelly spends plenty of time on the Coast and is often at Strad. In fact he is a Gold Coast rate payer. Our Mayor Tom Tate has already had a crack at Mick Fanning (wrong move). Kelly who is featured in this video at Strad is involved in creating wave pools. Meaning he understands better than 99.99% of the world the dynamics (as do most surfers) of how a wave is formed. Hence the twitter comments (see image) carry a huge weight. 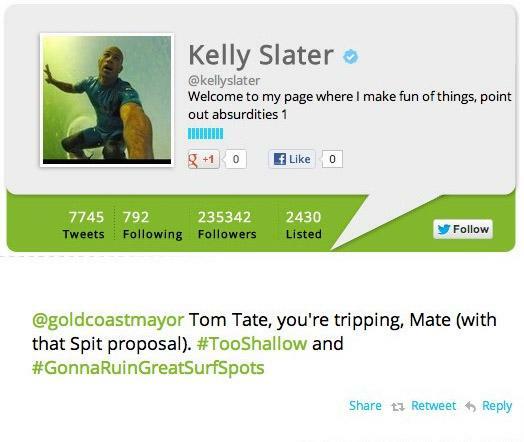 "Tom Tate you're tripping Mate, (with that Spit proposal)"
Will Kelly be subject to pressure or threats - similar to the announcement of the backflip to the reinstating of Kirra Groyne? Will insulting comments appear in local papers? It really just shows how out of touch people can be. This is now an international issue - it amounts to environmental vandalism and directly threatens some of the best surf in Australia. It's an embarrassment that we would even consider risking our coastline in this way. When they (Kelly Mick) are the best at reading the ocean - their say should not be dismissed. Surfers on the Gold Coast are often business owners, or hold down normal jobs - they choose to live on the coast as it is one of the few places you can regularly get great surf and have a normal lifestyle. In summer we can actually get up at 3 am for a surf. Ok so if you see these guys in the surf at Strad we owe them a wave (not that they have any trouble getting them anyway).